Avocados are in abundance at the moment and I am adding it to my salad practically every day. Today, I thought of making a dressing using the avocado instead of just chopping it and adding it to the salad. I love avocado dressing. Its a great alternative for mayonnaise or other egg based dressings. I was lucky to get some plum tomatoes from Nakumatt. We don’t get these delicious tomatoes often here. Whenever I am in UK or India, I prefer using plum or cherry tomatoes for my salads. However this does not deter me from making the salad whenever these tiny tomatoes are not available. I just use the normal ones. This salad is so colourful that anyone would get tempted to have it. I served it with a flat bread as dinner. Going to bed with a light stomach is good for health. The secret to any good salad is fresh, crispy, crunchy ingredients. Go one make this salad and enjoy it. Cut the tomatoes into half and put in a big bowl. If you are using big tomatoes, dice them. Chop the pepper and add to the tomatoes. Slice the olives and add to the salad. Add sliced onion and the chopped spring onion. Put all the dressing ingredient into a blender. Process till you get a smooth paste. 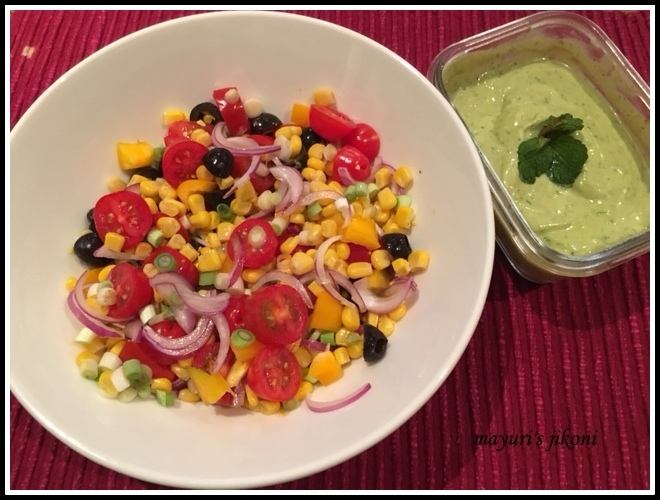 Serve salad with the avocado dressing. Leave the dressing in the fridge till required. Add other vegetables of your choice like cucumber, carrots etc. If the dressing is too thick, add a bit more yogurt. Thanks Beena try it out. Am sure you get all the ingredients in Kerala.